Yagna photo will be sent. One DVD of approx. 1 hour having the main ritual recording would be sent. Ayush = meaning age or tenure of life. Ayush Homam is performed on the day the child completes one year of age. In case one is unable to perform it on this day, it can be done on the consecutive month. It may be done even on a monthly basis. By performing the Ayush Homam the evil effects caused by day of the fortnight (Thithi), day of the week (Vara) & the constellation (nakshatra -star) are eradicated. It bestows longevity, prosperity and good health. It is experienced that even some of the common ailments, which cannot be diagnosed through mainstream medicines, are cured by the performance of this Homam. Ayush Homam is one such, performed on the completion of first year of birth Nakshatra. 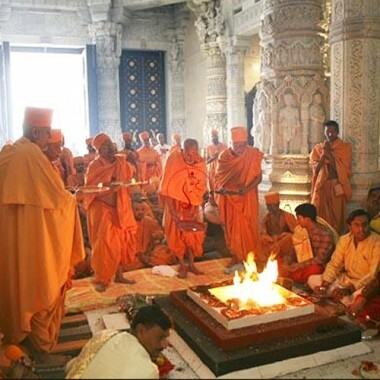 Primarily to pray for longevity and prosperity of life this Homam is performed. Once in a year this homa is recommended for healthy living and long life. If you are suffering from any ailment for long , then also Ayusah Homa is recommended. Markandeya, a great devotee of Lord Shiva remained young and immortal by His grace. He is called upon in this Homa to bless you with a good wellbeing and will power to recover from health ailments. Also, the other long lived ancient Seers like Ashwathama, Mahabali, Vyasa, Lord Hanuman, Vibheeshana, Kripacharya and Parashurama are called upon to ensure you with the blessings for a long life. Pooja service includes: Sthapana (Ganesh, Devi, Navgraha Kalash, Brahma), Swasti Vachan, Sankalp, Ganesh Poojan, Navgraha Pooja, Invocation of major Gods, Brahman Varn, Yagna, Donation & food to brahmins. PoojaShopOnline.Com priests will perform Pooja & yagna as per vedic rituals based on birth details. The Pooja prasad and photos will be sent to you through courier. Please mention your birth details (name, date, time, place) & Sankalp (wish) at checkout. This is a individual yagna (you may do pooja on individual name or include your near and dear ones in the pooja). You will be provided with the contact no. of the priest, to call during the sankalpa/yagna.